The terms are often used interchangeably, but a profound psychological divide separates the two. In an impressive multi-disciplinary installation, the artists featured in the San Jose Museum of Art's exhibition The House Imaginary take up the heady emotional meaning of how and where we live. In the aftermath of World War II, German philosopher Theodor W. Adorno wrote in Moralia Minima that the physical and psychological concept of home was forever altered: "Dwelling, in the proper sense, is now impossible." Global catastrophe delivered death and displacement to millions. More than seven decades later, death and displacement due to war and economic privation still plague the world's population, pitting aggressive nationalistic pride against our best impulses to care for one and all. The House Imaginary does not directly address the current moment, but instead approaches topics including immigration, forced migration, and the effects of income inequality as they register in the Bay Area — from a more suggestive perspective. 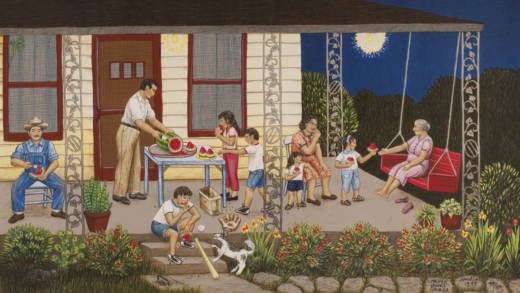 Located in the first of three second-floor galleries that host the installation, Carman Lomas Garza's 1997 color lithograph Sandia portrays a relatable, beautifully mundane scene: a multigenerational Latino family gathers on the front porch at dusk to eat watermelon. It is a scene that plays out all over the United States as spring gives way to summer, and warm evenings are tempered by the cool sweetness of the juicy melon. An accomplished image, and representative of Garza's commitment to portraying Mexican-American life, Sandia is all the more poignant for the humane message it conveys: the family unit — however that is defined — is central to our understanding of home. That concept is realized by who we live with, as much as by where we live. Two decades after Garza made Sandia, the Trump administration seeks to limit immigration under any terms, separating minor children from their parents as they are apprehended at the U.S.-Mexico border. It's a controversial policy designed to deter other migrants from seeking asylum in the United States. And it's a brutal tactic, one that robs us of our humanity, and robs those subjected to it of the familial normalcy Garza portrays. Memory, with its seductive potency and frustrating imperfection, is the exhibition's strongest through-line. Through memory, we may access the physical parameters of the places we've lived and those who lived with us, but the recollection may be fraught, if not painful. Indian-American multimedia artist Zarina Hashmi — known professionally as Zarina — reduces memories of home to minimalist compositions. 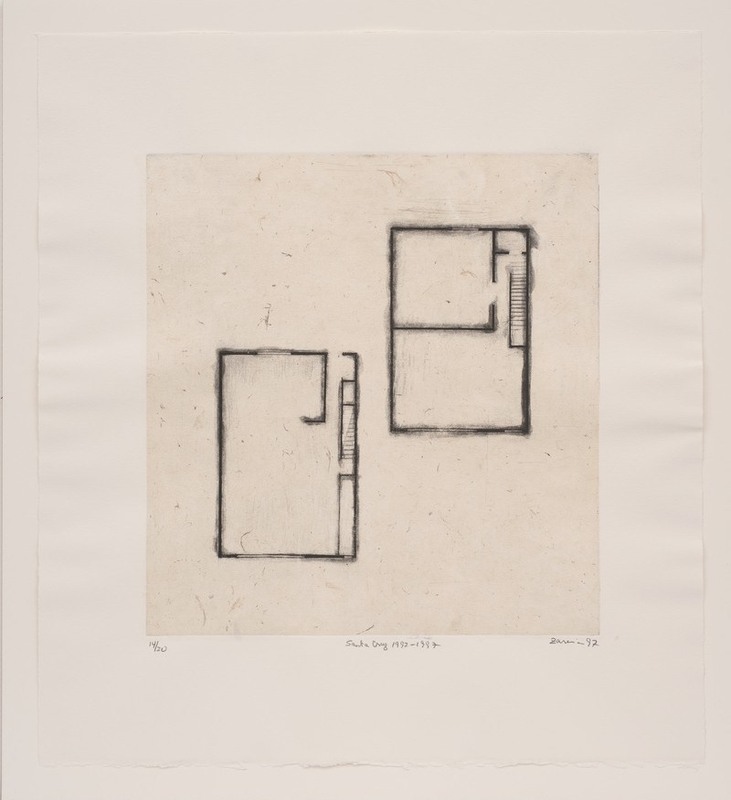 Homes I Made / A Life in Nine Lines is a series of ten etchings on paper, all of which recall different houses she inhabited. Some compositions include details like schematic staircases, while others resemble a child's rudimentary account of a peaked roof atop four walls. The series blends the exacting and unemotional clarity of the artist's college math studies with the memories of itinerant life interpreted years after it was experienced. They suggest that what she recalls are houses, simply the physical space one occupies, and not the emotional centers that we know as homes. Roger Shimomura's Memories of Childhood portrays celebration under exceptionally difficult circumstances. 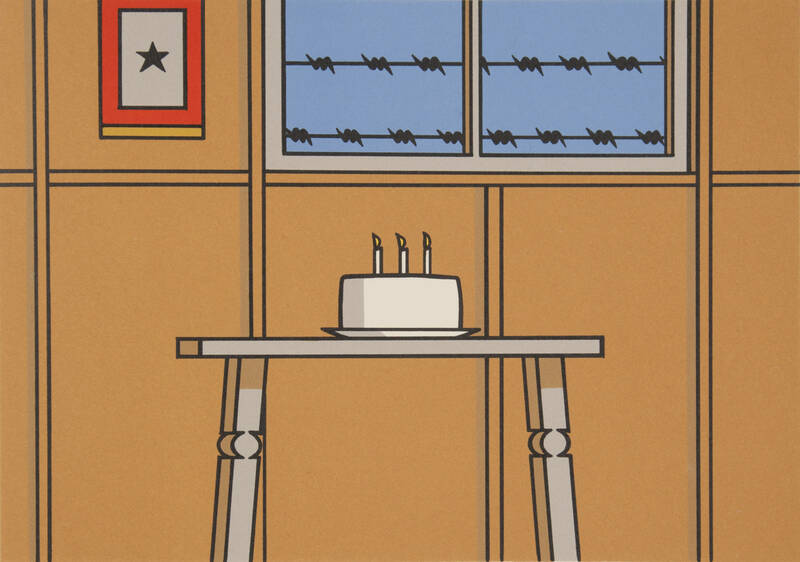 Confined with his family to two Japanese internment camps during World War II, Shimomura's lithograph recalls his imprisonment and the rare joy of birthday cake. His composition restricts the scene to the foreground plane. With no depth to moderate our perception, it is as if we experience the artist's memory as he did: immediate and unfiltered, a celebration confined by barbed wire. It is an experiential dissonance most of us will never know. In The House Imaginary, SJMA curator Lauren Schell Dickens has assembled a quiet but still powerful exhibition that marshals divergent accounts of house and home. Though Dickens and the SJMA staff may not have foreseen the deeply fractured social and political context in which the exhibition debuted as planning proceeded, the installation overall is an opportunity to be still, and contemplate how memory shapes our perceptions of safety, security, and identity as they are informed by our physical surroundings. 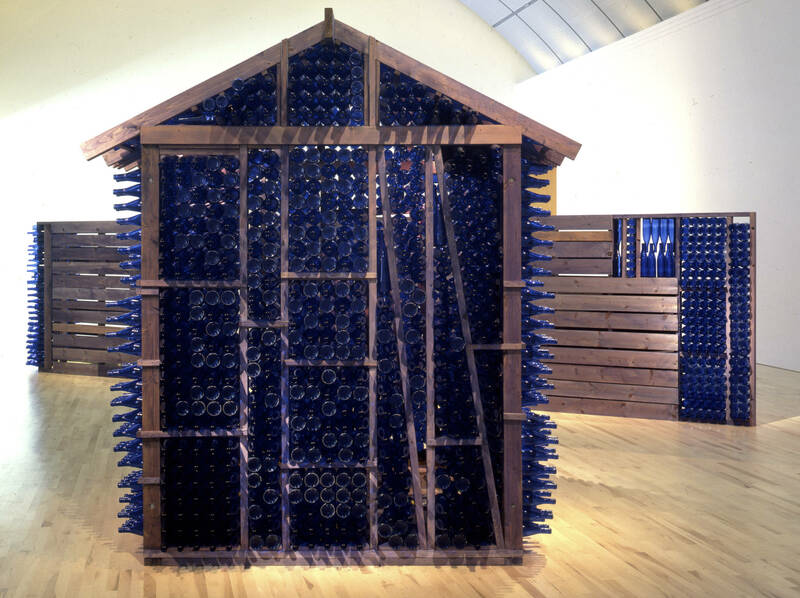 'The House Imaginary' is on view at the San Jose Museum of Art through Aug. 19, 2018. For more information, click here.